Mon, Apr 15, 2019, 07:54 pm SL Time, ColomboPage News Desk, Sri Lanka. Apr 15 (La Croix) Sri Lanka still has many mountains to climb before it can close this painful chapter in its modern history regarding a slew of as-yet unresolved cases of enforced disappearances and other human rights abuses that occurred during its 26-year civil war with the Tamil Tigers. The United Nations Human Rights Commission (UNHRC) approved on March 22 a proposal to give the country another two years to set up a credible war crimes investigation panel to look into those incidents. The decision was made on the final day of the 40th session of the UNHRC, which kicked off on Feb. 25, 2019. Beset by challenges in the aftermath of the war that ended in May 2009, the island nation found itself the center of attraction in the early stages of the session as it prepared a resolution (40/l) to co-sponsor such a panel. The other core co-sponsors were the United Kingdom, Germany, and Canada. According another resolution (30/1) issued in 2015, Sri Lanka was granted 18 months to establish a credible accountability mechanism. A change of government in January 2015 averted possible international sanctions over former president Mahinda Rajapaksa's failure to adequately deal with war crimes. Rajapaksa has since last year served as leader of the opposition. In 2017, another two-year extension was granted to Sri Lanka that expired this past March. Colombo was supposed to have honored its commitments to the U.N. body by that deadline. Up to 40,000 ethnic Tamil civilians are believed to have been killed in the final months of the civil war against the secessionist group known as the Liberation Tigers of Tamil Eelam (LTTE). As many as 100,000 people died in the conflict. According to one estimate, 12,000 disappeared amid allegations of extrajudicial military killings. UNHRC High Commissioner Michelle Veronica Bachelet Jeria told the council that Sri Lanka could regress politically and socially unless it at least addressed the "worst crimes" during the final stages of the war. However, there has been minimal progress in terms of accountability. As such, the government has been urged to invite the Office of the United Nations High Commissioner for Human Rights (OHCHR) to establish a fully-fledged country office to monitor the human rights situation on the ground. "My office highlights the critical role of Sri Lanka's independent commissions, particularly the National Human Rights Commission. Respect for their independence and implementation of the commissions' recommendations are needed to entrench the rule of law in Sri Lanka," said Bachelet, who has twice served as the president of Chile. She welcomed the move to make the Office on Missing Persons operational. She also commended the establishment of the Office for Reparations. She said the reform agenda was further hamstrung by the political crisis that engulfed Sri Lanka at the end of 2018 when two rival prime ministers both claimed legitimacy at the same time. In response to her comments, Foreign Minister Thilak Marapana said on March 21 he welcomed the adoption of the consensus resolution (40/1) by the UNHRC granting the country two more years to honor its commitments. He also invited the OHCHR to engage with local institutions to verify the facts on the ground. This confirmed Sri Lanka's political commitment to fair play and the progressive steps already taken by the government since 2015, Marapana claimed. Remarking on a suggested hybrid court featuring foreign lawyers and judges, he said Colombo has already repeatedly explained, at the highest levels of government, that its constitutional and legal challenges will be firmly grounded in the constitution and the domestic legal framework. The same logic and rules apply to its transitional justice process, he noted. "It would not be possible to appoint judges who are not citizens of Sri Lanka through such a process without amending the constitution, which would require the approval of at least two-thirds of all MPs and a public referendum," he said. Marapana argued that the actions taken by Sri Lanka's courts during the so-called "coup" that happened late last year "proved" that foreign judges were not needed. He was referring to the events that ensued when President Maithripala Sirisena appointed Rajapaksa as prime minister and dissolved parliament. Both moves were blasted as illegal and counter to the charter. The country's cabinet is now considering a bill to establish a Truth and Reconciliation Commission. 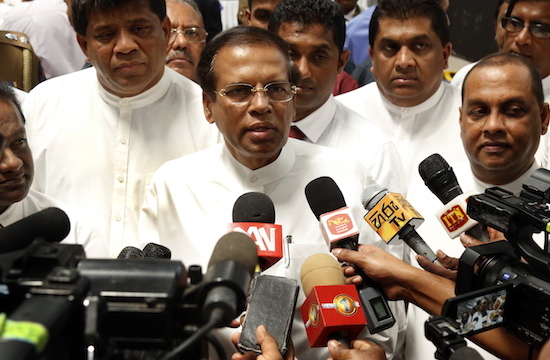 Sirisena said Colombo is resolved to fulfilling its reconciliation agendas and pledges to ensure the brutal war is not repeated. However, he has rejected Bachelet's proposal to set up a permanent OHCHR office. Sri Lanka's security forces were battling a group that many countries had designated a terrorist organization, and no allegations of war crimes against individuals or humanity have been confirmed, the president said. To support his argument, Sirisena cited the OHCHR Investigation on Sri Lanka (OISL) report of 2015. During the last four years, judicial independence has been restored to a large extent through the establishment of independent commissions. That being said, experts expect the situation to drag on for at least another decade before justice is served and the ghosts of the war laid to rest. When the conflict finally ended in 2009, then-president Rajapaksa met with Ban Ki-Moon, who was serving as the secretary-general of the U.N., and agreed to an accountability probe. The first challenge of the Sri Lankan government was to take a unified stance at the latest UNHRC session as the president wished to withdraw from the co-sponsored resolution as well as from other pledges. Rajapaksa said a decade has passed since the end of war and that the country is now at peace. "I want to tell them not to pressure us, and allow us to solve our internal matters. Why open old wounds? Just forget about this war crimes probe and let us live in peace and harmony," he said. However, it was the prime minister who conducted all the negotiations with the core group countries and decided to co-sponsor the resolution again to obtain another two years to satisfy its commitments. At one point, it looked as though Sri Lanka would be sending two delegations to the meeting to represent it. However, in the end, Sirisena agreed to send just one delegation headed by his foreign minister. My observation is that the president is not willing to make the necessary reforms. Even though the prime minister seems keen to execute the reforms, he lacks the required majority in parliament to do so. Meanwhile, Rajapaksa, Buddhist monks and even Cardinal Malcolm Ranjith have opposed some aspects of reforms. The reform proposals include devolving more powers to the provinces. This relates to broader efforts at reconciliation, as it would give greater authority to ethnic Tamils on their home turf. Now, any war crimes probes must be undertaken with the domestic legal framework, which means new legislation is needed. But the government has failed to address the concerns of a Southern Sinhala voting base angered by its decision to hound the Sinhala army for its alleged war crimes. Father Oswald Firth OMI, the former director of Caritas Sri Lanka, said the transitional justice process is essential for peace. He said many cases must be resolved for this to happen and the victims compensated, including the bereaved families of enforced disappearances and those whose property was stolen or destroyed. Even though it may fall short of the stature of a hybrid court, the legal system must ensure justice is served. The government has already set up its Office for Missing Persons and Office for Reparations, but the victims of the war will not be satisfied unless a proper mechanism for transitional justice takes force. The president and prime minister are currently at war with one another on this issue both domestically and internationally. With just seven months to go to before the next presidential election, it will be interesting to see how they proceed in fulfilling their reformist agenda.